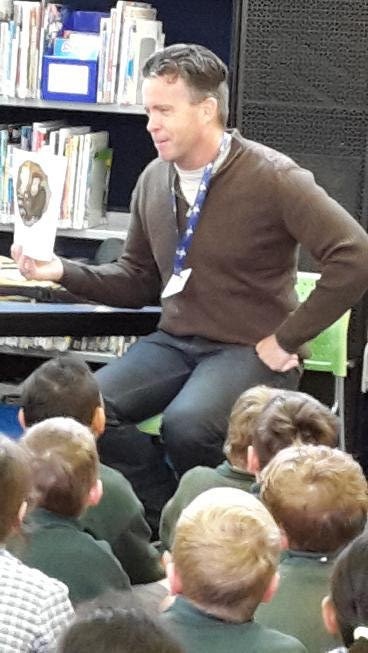 Yesterday author PJ Sheppard visited St Brendan's and read his picture book Davey's Hairy Fear to our year 3 and 4 students. He then talked about the process he goes through when he writes and where he gets his ideas from. 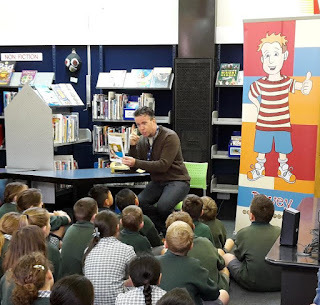 He also explained that although a picture book is quite short there are many steps to go through from the first ideas and plans, through adjustments and improvements to the final book, it takes months and months. Some people illustrate their own picture books but PJ said although he's good at writing, he's not so good at drawing so he asked someone else to illustrate his book. Afterwards there was time for a few questions before PJ needed to head away to his next appointment. Thanks for your visit yesterday PJ, it was a great way to start the week! PJ Sheppard was born in New Zealand but now lives near Melbourne, Australia. Davey's Hairy Fear is the first of three books about Davey, that PJ has written, the other two books will be available in 2016. You can find out more about PJ's books on his website HERE. Look out for a copy of Davey's Hairy Fear in our library soon.